I have a 2010 Acura TL and it consumes oil like a thirsty camel. In between oil changes, I'm constantly filling the oil back up with 2-3 quarts of oil. To add to the oil consumption issue, when I accelerate, my car makes a rattling noise. Took to dealership, got a valve adjustment, got the car back, same issue. Took car back to dealership, they said that one of my camshaft lobe is chewed up, which would be causing the rattling noise. I bought the Acura because of the longevity and ease of maintenance so I thought. However, the car is just going to end up costing me more money. An engine replacement has been recommended. I bought my Acura TL SH-AWD with the technology package from CarMax in 2011. When I bought it, it had 8,000 miles and had been a loaner car originally, then sat on an auction lot for a year before CarMax bought it. Ever since, I have treated the car like it was my baby since I know that if you take care of Hondas and Acuras, they can go up to/over 300K miles, as my previous Honda did. However, my best efforts were not enough due to the misleading oil sensor in the car, which is COMPLETELY WRONG and DECEPTIVE. I may not know much about cars, but what I gathered from the Acura mechanics is that the biggest contributing factor to the demise of my engine was the oil sensor. It does NOT alert you when the oil is low or when it has been 5000 miles from the previous oil change. I did not know how to check the oil and had no idea I was low on oil before the sensor alerted me. When the oil sensor shows 15%, apparently the oil is ~2 quarts low and it has actually been between 7-10K since the last oil change. Because the automotive places did not give me a sticker BECAUSE I had the sensor (which they just reset) and I did not know how to check the oil. I performed routine oil changes AS SOON as the light came on or when the sticker recommended I get the oil changed in the rare event a sticker was put on. I did not know how to check the oil myself, nor was I ever told by the dealership that there was such an issue, and therefore I didn't even get 100K out of the engine of a $45K car!!!! I only had 98,440 miles on the car when the engine died. The reason I bought an Acura was that they have a reputation for going forever as long as you maintain them. Obviously, this is NOT the case. Is this a conspiracy to try to get more money out of Acura owners?!? How does this happen? After investing SO much into the car, I am extremely upset that my Acura did not live up to my expectations (or my budget). Update from Mar 26, 2018: I also had a recall on my car for a torque converter replacement for cars under 8 years old and 105,000 miles. I went in to get it fixed in November 2017 (when I was still eligible) and was told by the dealership there were indeed issues with my torque converter that they took pictures of to document. The dealership told me to drive 50 miles and come back so they could order and replace the part and scheduled me an appointment on 12/17/17 (again, within the parameters of the extended warranty that ended on 3/17/17; ironically, the dealership re-scheduled my appointment 4 times so that I could not get my car into the shop until 3/16/16. In addition, they only focused on the knock in my engine and refused to replace the torque converter because they would have to tear my engine down. The mechanics then lied, stating they fixed the torque converter when I brought my car to be checked out in November (obviously that makes no sense since they told me to come back to have it replaced. Instead, the dealership called me and said my engine had to be replaced and to come get my car because they did not want to tear my engine down to further diagnose the knock and replace the recalled part. When I asked if what they were stating is that I should drive my car until the engine officially dies, the response was "well, pretty much." I was also told to sell it instead, but it wouldn't be worth much because of the engine. In addition, the mechanics lied and stated that I refused consent for them to tear down my engine to figure out exactly what was wrong/replace the part, as well as the engine if needed, when I was never given an option to do so. They were so shady that they didn't even give me a receipt - most likely because they knew they lied. Because I didn't trust the dealership since they did not even have my car for 2 hours before calling me to come get it, I went to an independent Acura repair shop that was opened by the official Acura dealership due to their shady ways, including how they repaired cars. The dealership is such a joke that they began to laugh whenever I mentioned what they told me about driving the car into the ground instead of further diagnosing it. I then found out that the dealership had been trying to obtain a motor from the INDEPENDENT Acura shop to put into another car, as well as several other parts they use as replacement parts. After they also advised me I would need a new engine and that there was no way to sell it with the condition the motor was in, I approved them to replace it. They also are replacing the belts, spark plugs, water pump, and many other parts I would need to replace in the future for free. They also told me it is common for 2010 Acura TLs to have excessive oil consumption issues and it had probably been low for the entire life of the car, which the dealership never mentioned. In addition, they offered a warranty on all of their work for free, despite my car being out of warranty itself. I called the National Honda/Acura line (after being advised by the Acura shop to do so), but they have refused to help since I went to an independent Acura shop and did not have EVERY record of EVERY oil change, on-time maintenance, etc. If they continue to refuse to assist me, especially since I already had to replace my VTEC system 6 months earlier, I will be telling my Case Manager that I will be filing a lawsuit instead. I'm sorry for everyone else that is going through this as well - I know the struggle is real. I urge you to also publicly complain (calling Honda/Acura, posting on social media, etc), as I have so that others are aware of the issue. Had a 2010 Acura TL as my third V6 Acura since 2004 (TL, MDX prior) and noticed at 132,000 miles it was using a lot of oil. It went from no need to add oil to a 2 quarts between oil changes at 5,000 miles. After some time it seemed to be increasing so I chaulked it up as an anomaly in my Acura experience. I loved the handling and design of the TL so I traded it in for another 2010 Gray TL in November of this year with 54,000 Miles on it. I was told it was owned by a local preacher's wife who hardly drive it more than a few miles each day and traded it because it was just outside of the warranty. As with any used car I buy I immediately change the oil filter, upgrade the air filters to K&N, etc. I noticed the oil was a quart low. After 2500 miles I heard a bit of valve rattling and checked the oil. It was 1.5 quarts low. I checked for burn off from the exhaust and nothing, no leaks, drips, or any signs of issues. The car is now at 61,000 miles and I have a standing joke that I add a half quart of oil with every fill up at the gas station which in my world is twice per week. I found this web site when searching for answers on this issue. I have a good friend who is also a Service Manager at Acura so I plan to print out these complaints and let them address the problem. The had looked at my previous 2010 TL and said it appeared to be burning the oil internally with no other traces of loss. They did compression test it and it show strong ratings across the board. The mechanic (not a service tech who changes components) said the engine should be changed and documented it for me. We sent it to Corporate Acura and they denied the claim. Eventually after several rounds of phone calls Acura said they would tear down the engine and if they didn't see any signs of oil burning I would have to pay for the tear down and rebuild. If they did find signs they would replace the engine at no cost to me. The tear down/rebuild cost was near $5,000. Why would I even take this risk because its their technicians word. Strongly reconsidering if the Honda/Acura line is what it used to be. I also have a 2012 Honda Pilot V6 and it does well with oil. Paid $44,000 for a new 2010 Acura TL. Love the car but it consumes oil - Acura won't help me. The car is paid off - I can't afford another car - I'm stuck feeding oil to this car. I'm going to write to Acura GM next - I can't afford this car. 3 Qts of oil consumed in 3,000 miles. Manufacturer recommends oil replacement every 6,000 miles. Tech at Jiffy Lube mentioned that this is a known issue they see with 2009-2010 Acuras and Hondas. He said that some have gotten there block and pistons replaced. However, no TSB currently exists specifically for the 2010 Acura TL. I recently noticed this issue with my 2010 TL. Got oil indicator at 40%. When checked with dipstick, there was no oil in the pan. Filled 1 Quart of oil and still could not find anything on the dipstick. Took it to the dealer and he found the 1000 miles my car consumed 3/4 Quart of oil. As per the dealer it is normal and with in the defined range of Acura defined parameters. Also he mentioned that you have to keep adding oil when it goes down. In other words, it is a problem but is normal as per the Acura's definition. After doing some research on internet and talking to few people, this is an ongoing issue with certain Acura models 2009-2013, specific to J37 engine types. Planning to take it to social media. Consumes 4-5 quarts of oil between oil changes. No solution found yet, documented with dealer but they start per owners manual "burning oil is normal"
2010 TL 6 MT burns oil. 1 quart per 1,100 miles so far. Just starting the infamous Acura oil consumption test today. I have owned multiple Hondas over many years and NEVER had such an issue. I know the Acura stance: One quart per 1,000 miles is acceptable. Yeah, I hear you Acura. The rest of the automotive world is watching and shaking their collective heads. Acceptable? Only if you are trying to hide and cover up a problem with the cylinder wall design. Normal? Not hardly. I am disappointed. Maybe Acura will do the right thing here. My experience tells me otherwise. Update from Nov 12, 2015: Acura of Omaha and Acura corporate replaced the short block. They took care of me. I will monitor oil consumption because the J37A4 simply burns oil. The engine is wonderful, though, and the car really is engineered for the driving enthusiast. Kudos to Acura and my dealer for being very customer driven. I bought my Acura TL used with 52,000 miles. I had it 2 1/2 months when I got a notice that it needed oil. When I checked it, it needed 2 quarts! It was due for an oil change shortly after, it was done then probably 2K later , I needed to add oil gain, my notice did not come on, i was so nervous about having added 1 quarts to a car that is barely broken in that i started checking the oil constantly! Now I have been online reading all kinds of reports & complaints of people having the same problem! Can anyone tell me if there has been a class action or anything about this oil consumption matter ? What can i do? I read a complaint from some one in Annandale, NJ a bout the dealer there not taking this seriously and i have dealt with the dealer with my last Acura that I bought and they are not a good dealer so I do not know where to turn for help with this. Suggestions anyone please? At 40% oil life, got a warning on navigation system screen that an indicator light was on for low oil. Checked dipstick and nothing registered, had to add 3 quarts of oil to get in acceptable range. This has happened twice before but only when it was due for an oil change and oil life was 20% or below, Acura claims that burning 1 quart per 1000 miles is acceptable but to me this is excessive. I have not brought this latest episode to their attention yet as I'm sure their response will not be satisfactory to me. Previously brought it to their attention but the one month checkup revealed 1 quarter per 1200 miles which they deemed acceptable. Based off of this forum and other complaints I see, this is clearly a problem specific to Acura engines and something needs to be done about it. Their assertion that 1 quart per 1000 miles is normal should be challenged as that would mean that most folks wouldn't be going for an oil change every 3000 miles as there would be no oil left to change. Update from Nov 25, 2016: I have been dealing with this burning oil problem for quite a while now and have been checking and adding oil between oil changes. On November 23,2016, I was driving up the highway and my engine began misfiring reducing power and causing a sputtering and bucking feeling. I turned around and was able to make it home driving slowly with my hazards lights on and called AAA to have my car towed to Acura of Peabody. It is currently being worked on and they need to remove the engine manifold to find out what is causing cylinder #2 to misfire. This going to cost me well over $1,000 and I feel that this is related to the engine burning oil. I'm not sure what legal recourse I have on this but I intend to pursue it. I will update this further when I know the outcome. Bought 2010 Acura TL in July 2010. Since then, the car has been consuming oil at a rate that is truly ridiculous. I have to replace (top off) the oil every two-three weeks. I kept up with it as I drove the car for the first 4 years. However, this year it became such a problem that it eventually led a complete engine failure. I explained this to my dealer consultant 3 years ago and was told that "the manual just consume more oil." That may be the case, but I used own a Pontiac Trans-Am with a V8-LS2 motor and it consumed less oil than my TL. The deal has done every test money could buy and they never managed to find anything wrong with the car. It all came to a head about a month ago when the engine oil warning light came on and started singing. Before I could fill it with oil again, the engine self-destructed. I don't want to exaggerate, but if you own a TL and your having consumption problems, dump the car. It won't get better and the dealer is no help. I don't understand this issue because I owned a 2005 TL and had no issues. The 2010 has been an absolute nightmare from the start. If you own this car, take heed. If you are having consumption issue get rid of it while the car still has value. I planned to trade mine in, but the motor quit before I could. Don't be like me. get rid of the car and buy something not a Honda product. I loved my '05 but I hate the 2010. FYI, if you keep the car and the motor fails standby for a $7000 fix. I got a nice, low mileage motor to replace the failed motor but it cost $4100 plus labor to replace. All tolled, I paid $7300 dollars to replace the motor at 126K miles. I did not expect or foresee that the motor would fail or that it would be so expensive to fix. Bottom line, if your having oil consumption issues dump the car while you still can. After this experience, I'm done with Honda/Acura, and its too bad because I really like the new NSX but theres no chance in hell that I would risk buying one. With my 2010 Acura TL SH-AWD manual, I realized the consumption of oil after my first oil change since I got the car in January of 2014. I have a habit of checking my car oil and I noticed the oil on the dip stick was nearing the bottom. Since then, I check my oil every 2 days and I add a few oil when I notice the oil on the stick is getting low. I know these dealerships can't really do anything about oil consumption so I don't even bother to go to them. It is simply an issue with most of this modern cars. My 2004 Nissan Maxima had oil consumption issue before I got rid of it. My advise is to check your car oil regardless of how new the car is. I believe these modern cars engines(especially the V6 ) create so much heat inside that, it is literally burning off engine oils. Check your oil regularly and maintain the oil levels so you can get longer life out of it. Believe me this dealership really can't duplicate what goes on inside the engine when you drive. It is an engineering issue that has to be dealt with when they are building these cars. You are better of getting a 4 cylinder if you want to avoid some oil consumption issues but I am not sure if other owners with 4 cylinder are experiencing the same issue as the 6 cylinders. Persistent ongoing oil consumption issue, which dealership and Acura Client Services continue to deny. Today I checked and there is no oil registering on the dipstick. Oil is at 40% life. I had to add 2 quarts 5W-20 before any oil would register on the dipstick. How can it be "normal" for an engine to consume this much oil? Plus, I am still under power train warranty, which Acura refuses to honor. I have been dealing with excessive oil consumption issues with my 2010 Acura TL 6 speed manual, since March 2011 just before my 50,000 mile warranty was up. Back then the "Low Engine Oil" warning came up with only 20% oil life left, and over the past 45,000 miles of driving since then, has slowly progressed into happening sooner and sooner in between Acura recommended oil changes. At the time I asked the local Acura dealer to please note this issue with Acura of North America to record this happened while still in warranty. Since the first time, the "Low Engine Oil" warning light now comes on earlier into the oil and maintenance cycle. From 20% left, it came on again at 40%, at 50%, 60%, now at 80% 45,000 miles later. I did an engine oil consumption test at 73,000 miles by the dealer, and was told the oil consumption was within the 1qt every 1,000 miles of usage. I restarted this test at 91,000 again with an Acura Case Manager keeping in touch with the local Acura dealer. The dealer didn't want to do this test again, and has shrugged me off as not being important. I went back after 1,000 miles, and showed them there was NO oil on the dipstick. 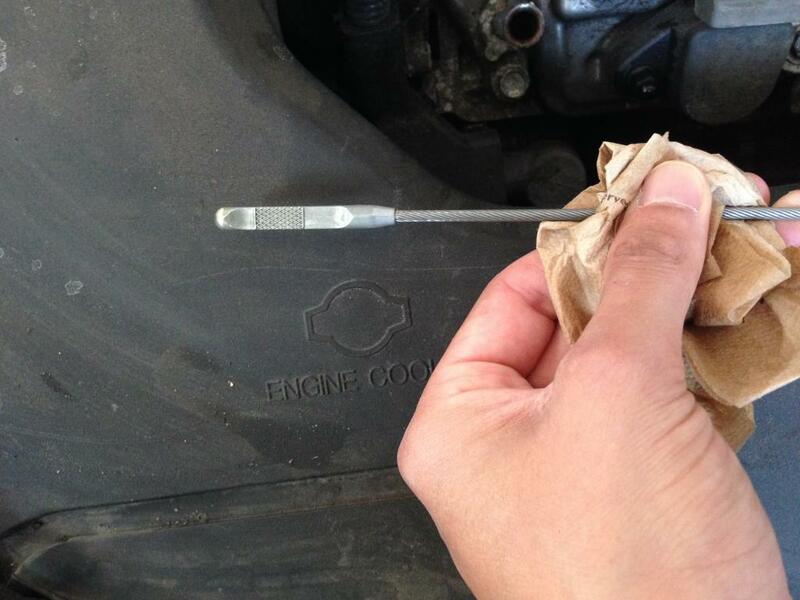 The mechanic showed me a drop of oil on the bottom of the dipstick, and said that is OK. I told him there is no oil at all on the dipstick, and is unacceptable. He then filled exactly 1 quart, and it filled just below the top line of the hash mark. I informed him that on my next visit, I bet I will be back before 1,000 miles now. I made my concerns known to the Acura Case Manager helping me, and told her they aren't filling in their own Oil Consumption test worksheet out properly by not indicating no oil on the dipstick and she told me to go again at another 1,000 miles to see the oil level. Recently, I got the "Low Engine Oil" warning light with 910 miles into the 1,000 mile test. I brought my car home immediately and then took it the next day to the dealer as instructed by Acura. I waited for a while in the waiting room, and then asked them what the results were. I was told again that they only added 1qt of oil, and I told them I checked the dipstick again before coming and it was bone dry. I was shrugged of by the Asst Manager telling me that "you can't drive around without oil, and if your not leaking oil, then where is it going?" Well isn't that their job to figure out? I am now being told by my Acura Case Manager that the next step would be for me to pay anywhere between $250 - $350 for an engine compression test. I really feel I shouldn't be paying for this test, and also do not trust this dealer to do this properly, and report the correct findings, since they have not taken this issue seriously for the past 45,000 miles. I am at a point where I will NEVER buy a Honda or an Acura ever again, based on my experiences with the company. So much for myself and others saying that "You can't go wrong with a Honda. Honda engines are bullet proof, and all you need to do is change the oil." My experience is you have add oil every 1,000 miles, and don't bother paying more $ going to an Acura dealer to get your work done. Save your money and go to your local mechanic who can do everything they can... CHEAPER! They obviously don't stand by their product, and allow their dealerships to lie and report false statements on issues. In January of 2014 the car's warning system indicated that the oil level on my TL was low. I took it to the dealer and they confirmed that oil levels were low. They changed the oil and asked me to drive it for 2,000 miles and return it for an oil consumption test. I took it back after 2,000 miles and the test proved that it was over a quart of oil low. The dealer kept the car for a couple of days and performed an inspection. Their assessment was that the reason why it was consuming that much oil was because I was driving it "too hard". I explained that it was not the case and that I wanted it further looked into. I contacted Acura Client Services about the issue to see if it would help and they told me that consuming a quart of oil every 1,000 miles was normal. They are now conducting another oil consumption test and I was instructed to return the car after 1,600 miles. I was also instructed to drive the car so that it would show an improvement in the MPG. I'm pretty sure it's not normal for a car that only has 37,000 miles to burn a quart of oil every 1,000 miles. The technician that helped initially explained to me that "at 37,000 miles or 137,000 this car should not be consuming any oil". I'm interested to see how they handle the issue when I return for the second oil consumption test. Beginning in May 2013 I noted unusual oil consumption in my 2010 Acura TL AWD. I have owned six prev Acura including those with VTEC engines and have never had similar oil consumption. Use of oil (I use conventional oil) has varied and has been up to 2/3 quart in 400miles or 1.6/1000miles and at other times significantly less. It varies with the amt of mileage since oil change. Most of oil consumption in the last 1000 of the 3000 mile interval. I change oil every 3K miles. My maintenance minder never goes off as I change oil ever 3K yet I still have consumption problems. Lowest oil life I have ever had was 60%. Use conventional Honda oil at Acura dealer or Pennzoil at NTB. Oil wt 5w20. Overall consumption in 3000 miles probably about 2 quarts on avg estimate . Acura says this is normal but Corporate Acura district manager in Torrance Calif headquarters won't release in writing what their criteria are for oil consumption and claim this is "internal and private information" and don't want to be recorded saying that. This sounds like hiding what should be legitimately available information to owners who are responsible for monitoring their oil. This degree of oil consumption is NOT normal to me as a six time Acura owner and NOT reasonable. Acura is trying to minimize the issues. I think Acura owners with similar problems need to organize and coordinate their efforts . I encourage you to CONTACT ME me and Acura and SPEAK UP to tell your true story. Numbers of voices with articulate complaints count. DON'T let yourself be treated this way without an objection if you feel it is not right. A $40K oil burning machine- Dealer states that Acura vehicles can burn up to 1 quart of oil every 1K miles. It does not make any sense.My old Honda (266K) miles did not burn that amount of oil. Current oil change scheduled every 5K miles, but at 4K, the vehicle needs oil badly! Acura answer was keep working with dealer or trade your vehicle.